Last Month Fellowship Place was honored as a 2016 Community Champ for collaborating with the Specialized Treatment in Early Psychosis (STEP) Clinic. 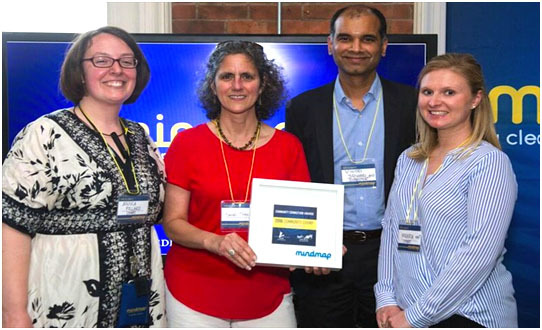 Pictured from Left to right: Dr. Jessica Pollard, Program Director, STEP Clinic; Sandi Sibilio, Director of Career Development Services, Fellowship Place; Dr. Vinod Srihari, Medical Director, STEP Clinic; and Miranda Mast, Employment Specialist, Fellowship Place. Social Cognition and Interaction Training (SCIT), a psychotherapy group for individuals with psychotic disorders. Employment services provided by Fellowship Place to clients of the STEP Clinic. The Employment Specialist assists young adults to get the skills to find and secure a job in the marketplace. Sixteen individuals have been assisted with finding employment as: teacher’s assistant, cashier, bagger, cafeteria worker, sales associate, produce clerk, busser, barista, mental health activist, summer camp assistant director, overnight stocker, warehouse worker, editor’s assistant, dishwasher, and driver’s helper. One individual was provided with prevocational training in Fellowship’s Food Service Training Program. Education services provided by Fellowship Place to clients of the STEP Clinic. Fellowship’s Education Specialist assists clients with services and supports necessary to be successful at college or trade/technical school. Three clients have been assisted to attend post-secondary education: one is attending Southern Connecticut State University and two are attending Gateway Community College. Art exhibit hosted by MindMap, a public information campaign of the STEP Clinic. The MindMap art show was held during May – mental health awareness month. Many Fellowship Place artists were featured in the show.